The CSM Award is the Society's Premier award for senior researchers. After several recent name changes over the last few years, the CSM Executive has decided to permanently name the award in honour of the Murray family. Professor R.G.E. Murray and his father E.G.D Murray had a seminal role in the genesis of the CSM, and both had storied careers in microbiology. The Society is honoured that Professor R.G.E. Murray has agreed to have the family name affiliated with the CSM Award. Canadian Science Publishing, publisher of the Canadian Journal of Microbiology, has been sponsoring the award since 2011. We are now accepting nominations for the 2019 CSM Murray Award - the deadline for nominations is April 1st, 2019. Please refer to the 2019 CSM Murray Award Call for Nomination Information for more details. Microbiology in Canada received national attention when Professor Emeritus R.G.E. Murray, University of Western Ontario, was appointed as an officer of the Order of Canada. He was honoured for his lifetime contributions to the development of microbiology in Canada. The Canadian Society of Microbiologists owes a special debt of gratitude to Dr. Murray. He was chairman of the Founding Committee for the Society, 1950-1951 and Founding President, 1951-1952. The Society, he said, was "a much-needed catalyst and unifier for the diverse applied and basic microbiologists of the country". He has remained an active member of the Society throughout his scientific career and was elected an honorary member in 1985. Societies and their journals, particularly the Canadian and American Societies, continued to be important to Dr. Murray over the years. He persuaded the National Research Council of Canada that a microbiology journal was a justifiable publication and was appointed the founding editor of the Canadian Journal of Microbiology, 1954-1960. Prior to this appointment, he was a member of the editorial board of the Journal of Bacteriology, 1951-1954, and again from 1980-1986. He found his editorship of Bacteriological (later Microbiological, then Microbiology and Molecular Biology) Reviews, 1969-1979, to be a challenge, during which he honed his editorial skills. This involvement with the review journal increased his interest in the affairs of the American Society for Microbiology. He was elected President, 1972-1973, and an honorary member in 1988. He was also elected an honorary member of the Society for Applied Bacteriology in 1988. One of Dr. Murray's passions in life has been taxonomy. He inherited this interest honestly from his father, E.G.D. Murray, who was a trustee of Bergey's Manual of Determinative Bacteriology, 1936-1964. After his father's death in 1964, he was asked to join the Bergey's Manual Board of Trustees, and thus began another long association of a Murray with Bergey's Manual. He was Chairman of the Board of Trustees from 1976-1990. He has been a member of the International Committee for Systematic Bacteriology (International Association of Microbiological Societies) since 1962, and chairman from 1982-1990. He was elected an honorary member of ICSB in 1990. He was associate editor of the International Journal of Systematic Bacteriology, 1982-1990 and editor from 1991-1994, and he was a member of the Board of Directors of the Canadian Bacterial Diseases Network of Centres of Excellence in an advisory capacity. Dr. Murray's research in bacterial cytology, structure and function, and systematics and taxonomy has brought numerous honours and awards: the Harrison Prize, Royal Society of Canada (shared with C.F. Robinow), 1957; Fellowship in the Royal Society of Canada, 1958; the Canadian Society of Microbiologists Award, 1963; election to the American Academy of Microbiology, 1973; the Flavelle Medal, Royal Society of Canada, 1984; and the J. Roger Porter Award, American Society for Microbiology (U.S. Federation of Culture Collections), 1987. He also holds honorary degrees from the University of Western Ontario and the University of Guelph and was granted the degree Doctor of Science honoris causa by McGill University in 2007. And, many of his students and postdoctoral fellows continue the fine road in microbiology he has forged for them. This award is given to stimulate and recognize new researchers in the microbiological sciences. The award comprises of complementary registration to the annual conference, $1,500.00, and an inscribed scroll. More information about the award and the nominations process is available soon. We are now accepting nominations for the 2019 Fisher Scientific award - the deadline for nominations is April 1st, 2019. Please refer to the 2019 CSM Thermo Fisher Scienific Award Call for Nomination Information for more details. University nominations are reviewed and ranked by a 3-member International Scientific Committee. The award consists of a cheque of $500, framed certificate, travel, accommodation, and complementary registration to the annual conference. The Armand Frappier Award is made possible by the generous financial support of CSM. We are now accepting nominations for the 2019 Canadian Graduate Student Microbiologist of the Year award. The nominations deadline is April 1st, 2019. Please refer to the Terms of Reference and complete the nomination form (PDF) or (Word) format. Armand Frappier was a founding member of the Canadian Society of Microbiologists, and its third president (1954-55). It is with great pride to report that this past year he has been inducted into the Canadian Medical Hall of Fame. A full accounting of his accomplishments, and links to a vignette are available at Canadian Medical Hall of Fame website. In order to honor Armand Frappier the Society has renamed one of its major awards. The CSM Gold award is now Armand-Frappier Outstanding Student Award/La bourse Armand-Frappier pour l'étudiant exceptionnel. The award with its new name was presented for the first time at the CSM 2012 Annual Conference in Vancouver. Professor Roger Knowles, Professor Emeritus, Department of Natural Resource Sciences, Faculty of Agricultural and Environmental Sciences, Macdonald College, McGill University. Roger Knowles was an internationally recognized leader in nitrogen and carbon cycling in terrestrial and aquatic ecosystems. His contributions to advancing our knowledge of denitrification, nitrification, nonsymbiotic nitrogen fixation and methane cycling is documented in over 160 peer-reviewed articles and book chapters. Roger’s lab provided training to over 50 graduate students and 20 postdoctoral fellows. Roger was a past president of the Association des Microbiologistes du Quebec and the Canadian Society of Microbiologists. He served on several committees as a member of the American Society for Microbiology and Soil Science Society of America. Roger was made a Fellow of the Royal Society of Canada in 1987, awarded a D.Sc. from the University of London in 1986 and was a member of the Society of Sigma Xi. Please refer to terms of references. Dr. Terry Beveridge was a strong supporter of the CSM, always an advocate for excellence in student research and in communication of their work. He participated as a reviewer of poster and oral presentations and was enthusiastically supportive of recognizing outstanding achievements. Following his death in 2007, his colleagues in the Department of Molecular and Cellular Biology established a scholarship fund to help graduate students expand their knowledge in the field of microbiology. Terry’s family and his colleagues in the Department of Molecular and Cellular Biology at the University of Guelph have worked with the CSM to transfer the Terry Beveridge Memorial Scholarship Fund for administration by the CSM in support of graduate student activities. The Terry Beveridge Memorial Scholarship Fund is now sponsoring awards of $500 each for 3 meritorious poster presentations at the annual CSM conference. As of the 2013 CSM Conference, the poster competition will be named the Beveridge Poster competition and three awards will be presented to the best student, first/senior authored posters at the CSM Annual conference. 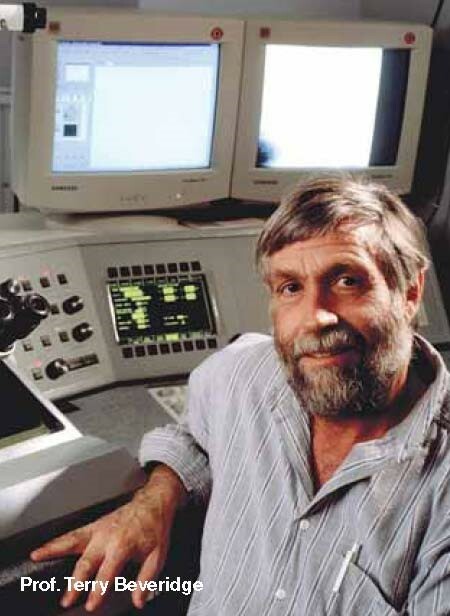 Terry Beveridge was a Professor of Microbiology at the University of Guelph for 29 years where he developed many approaches using electron microscopy to understand bacterial structure. Terry’s focus on microbes began at the University of Toronto where he completed both B.Sc. and M.Sc. degrees, his M.Sc in the lab of Dr. M. Goldner working on anaerobes associated with periodontal disease. In 1974 he began his PhD at the University of Western Ontario under the supervision of R. G. E. (Bob) Murray. Terry’s interest in the application of electron microscopy was sparked in Dr Murray’s lab and developed into a lifetime passion. Terry’s time at Western and his work with Dr Murray and his colleagues in the Murray lab resulted in 8 publications in his first 4 years and several more in subsequent years as Terry was getting established at the University of Guelph. Using electron microscopy as his foundation, Terry developed a wide range of collaborations including chemists, physicists, and microbiologists, thereby exposing his own students to a breadth of approaches that could serve as a definition of multidisciplinary research. A large number of undergraduate, graduate and postdoctoral fellows were mentored by Terry, always with a guiding patience (well, almost always patient) that encouraged independent thought and innovative approaches. Terry published extensively during his career, producing over 260 peer-reviewed journal articles, more than 60 books, book chapters and reviews, and gave numerous guest lectures, travelling worldwide. He also held several visiting professorships, carried out consulting work and was active on many scientific committees. In addition to contributing to the scientific literature, he was also instrumental in maintaining its quality, serving as editor of the Journal of Bacteriology for several years and as a contributing editor to a wide range of scientific journals. Terry was the recipient of many awards including the Canadian Council's Killam Prize, Fellowship in the Royal Society of Canada, Fellowship in the American Academy of Microbiology, a Culling Medal from the U.S. National Society of Histology for unraveling the chemistry of the Gram stain, and was the first microbiologist to win the prestigious Steacie Prize, awarded by the National Research Council to outstanding scientists under 40 years old. Terry was awarded the Roche Diagnostic CSM Award for career achievement in 1994. In 2002, he received a Canada Research Chair in the Structure of Microorganisms. As his research evolved, Terry became a leading figure in the science of Geomicrobiology and in specialized applications of electron microscopy that brought us amazing images. In 2009 a newly discovered bacterium was named in honour of Terry. The isolation and characterization of Bacillus beveridgei is first described in Extremophiles (2009) 13:695–707. Terry contributed enormously to the Canadian microbiology scene and the CSM is grateful for the opportunity to honour his achievements via the Beveridge Poster Competition. Up to six awards valued at $500 each. The award is accompanied by a certificate of merit. To recognize outstanding promise in an undergraduate student for early career contributions to microbiology and to encourage continued interest in microbiology and student engagement with the CSM. Any faculty member of a Canadian university may nominate one full-time student for this award each year. The student must be a CSM member at the time of nomination. Nomination letters must be accompanied by a 1-page (single-space, 12pt font, 2 cm margins) essay by the nominee called “Why the study of microbiology is big science” in addition to an unofficial transcript of the nominee. Applications should be sent as a single combined PDF document to the CSM Secretariat and will be accepted until April 15th, 2019. Nominations will be evaluated by the Education and Careers Committee based on the student essay, academic performance, and the nominating letter. A photograph of the recipient receiving the award certificate must be submitted for use on the CSM website within one month of presenting the award. Up to two awards valued up to $1500 each. The award includes a $200 honorarium and up to $1300 to cover travel-associated expenses. To enable outstanding graduate students or early career postdocs (within 2 years of graduating) to present research at one or more Canadian academic institutions (a regional location and / or a national location). The ambassador’s home institution is not an eligible regional location. Refreshments, intended for other graduate students to network with the Ambassador, is recommended if the budget permits. an abstract of the talk written by the applicant (100 words or less), a justification for two target institutions for presentations (50 words or less) and a digitally recorded video. The 5-minute (or less) video must feature the applicant explaining why the committee should select them to serve as a CSM Ambassador, entitled “Why I want to be a CSM Ambassador”. Note that priority will be given to applicants from institutions that have not been awarded a CSM Ambassador Award previously. The CSM Ambassador must be a standing member of the CSM for at least two years at the time of application. The recipient must submit receipts for reimbursement within 8 months of receiving the award. The recipient must also submit a short 100-word summary of the outcomes as well as a photographs of the talk to be shown on the CSM website. The Ambassador is also invited to present their summary in person during the Council and Annual General Meetings the following year if they are already attending the conference. A maximum of twenty travel awards to the CSM Annual Conference in the amount of $250 each will be given. All Students and Postdoctoral Fellows who are registered as CSM members and are submitting an abstract will be automatically considered for the travel awards with the following provisions listed below. The awards will be given to Students and Postdocs from outside the province where the conference is being held. The CSM Meetings Secretary will select the awardees on a lottery basis and advise the award winners before the conference. Students selected to participate in the Student Symposium Competition will not be considered for these travel awards as they are already receiving travel awards as participants of the competition. These travel awards can be combined with the Beveridge Poster Award and Knowles PD Research Prize. Travel Awards will be presented at the CSM President Banquet. A maximum of five travel awards in the amount of $400 each are available to cover travel to the CSM Annual Conference. Awards will be given to students from outside the province where the conference is being held. Submissions will be evaluated by the Career Development Committee based on the conference abstract and description of research project/goals. Both the abstract and 1-page research description should be sent to jneufeld@uwaterloo.ca on or before the abstract submission deadline (April 15, 2019). Late requests will not be considered. The CSM would like to acknowledge The Atlantic Canada Society for Microbial Ecology for their support of $2,000. This will support one award worth $500 and a certificate presented by the Atlantic Canada Society for Microbial Ecology. The award will be presented for the best student oral presentation in microbial ecology. The balance of the funds will support student travel awards. The CSM would like to acknowledge The Canadian College of Microbiologists for their support of $800. This will support one award for $500 and a certificate presented by the Canadian College of Microbiologists. The award will be presented for the best student oral presentation. The balance of the funds will cover the cost of the frame, certificate and travel awards. The CSM would like to acknowledge Cedarlane's support. This will support one award of $750 and will be presented to the best student presentation as part of the student symposium competition. The plaque will be prepared by Cedarlane and forwarded to the winner after the conference.